About 20 years ago - I was walking down Tottenham Court Road when this stranger asked if she could buy me a coffee in this cafe behind us. She was not unattractive - so I readily agreed. Once inside - she asked me quite personal questions - while stroking my hand and staring me straight in the eye - with all the earnestness she could act. Of course she was a brainwashed member of the scientology cult. As naive & new to the west as I was then - I legged it away! But I was very much reminded about this encounter at last nights first OPEN (Olympic Park Engagement Network) meeting. I have never had my hand shaken so many times - while earnest reassuring eyes remained locked on mine - being asked to 'tell me all about it' - since that encounter with the scientology cult. The same training used to brainwash the poor students from the nearby uni's in Tottenham Court Road - has been used on all the staff at the Olympics. They are the Olympic 'family'. They flirt & smile their way through conversations. They firmly hold your shaken hand while assuring you that they're 'on your side'. They use plants to big up the Olympics in an open forum to impress the neighbours. They repeat the same platitudes (& jokes) over & over again (forgetting that some of us have heard them speak at many other meetings before). But most of all - they are so completely & absolutely convinced that theirs is the only way!!! The massively noisy soil washing plant simply could not be sited any other position other than directly opposite the only residential sites neighbouring on the Olympics. The Olympics will only be a force for good for us poor & oiky Hackney, Tower Hamlets & Newham residents. The beautiful trees & shrubs we have spent the best part of 20 years cultivating opposite Leabank Square - were 'unfortunate' in that they had to be chopped down to make way for the new road. The benefits of joining them in breathing, drinking, living & experiencing everything Olympics - far outweigh simply carrying on living our normal boring day-to-day existences. I could go on & on listing all the similarities between a cult & the kind of training that these suits & PR luvlies get - but frankly I have a garden to go & water now. I have emailed all the answers (such as I could honestly get) to you all individually - so please follow them up with me (or them) if you need clarification. Oh! & Mr Olympics......... if you're going to bus your next load of potential cult converts to your HQ - please have the decency to bus the ones who don't want to be converted back to the bikes at the train station. Miah turned 4 yesterday - and Mum Lisa organised a beautiful treat for her!!!! Look how pretty she looks in her polka dot dress!! Check out this amazing underwater bouncy castle everyone! All the kids in Leabank Square had hours of lovely fun working off all that excess energy. Lisa even extended the hiring hours so that loads of the parents could have a go later in the evening as well. Loads of fun was had by all on Miah's special day!! We all remember what the view over the River Lea used to look like before we started planting trees over there. The Hackney Wick Dog Stadium was still there, Arena Fields was still a fantastic place for a picnic & kick-a-round - but it did look a bit bare. That's when a whole heap of Leabankers started planting lush green trees just over the river in order to make our little corner of Hackney Wick feel like the oasis it did. And didn't it look great?!? Even when the Olympic Wall went up - our trees still made the area feel green. Today the tree cutters moved in! All that hard work, all those years of trees getting watered by us carrying buckets to & from the canal, all those mature trees - getting felled within minutes!! We all know just how long it took our trees to grow & make our stretch of the river look beautiful & green. Do you think that the Olympic people are going to replace these trees? 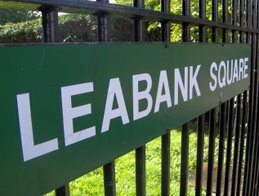 For those of you that missed it - this is a link to the brilliant Iain Sinclair walkabout opposite Leabank Square on Wednesday. He paints a picture - as most talented authors do - of a world caught between the decaying industrial & the promised regeneration. I am sure that all of us who have regularly walked & cycled all around this Lea Valley will identify with what he has to say. I'm no too sure how long Radio 4 keep these links up - so please visit it as soon as you can. I found myself being half-nostalgic for what we are currently losing - and half excited for what it is we are constantly being promised we are gaining! Oh - on the promise - the suits are still asking how many of us are going to the meeting on this Wednesday (see: http://leabanksquare.blogspot.com/2008/07/olympic-tour-anyone.html) - so far I think there are only 3 of us - we need a bigger representation from Leabank Square. Following on from Diamond Geezer's link for Leabank Square - we now have a photo included amongst the amazing street photographer sarflondondunc's pics!! How's this for a BIG UP to Hackney Wick?! Time out have written a great piece about the art scene all around Leabank Square. 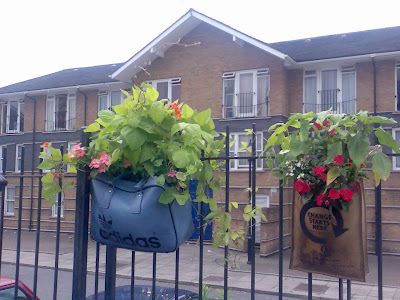 Never mind the Olympics - the best way to improve our area - is to encourage more artists to move in. The theory is that loads of artists all look for a cheap place to live & work - especially one that has large old warehouses & factories - they're better to set up studios in. Once there is a small colony of artists - this encourages more shops & cafes to open up - thus making a better community to live in. 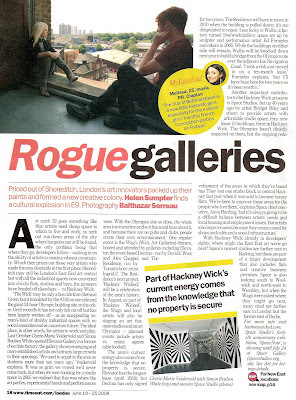 So next time you hear of a friend wanting a studio - please refer them to this article in Time Out: http://www.timeout.com/london/art/features/5030.html and tell them to tell ALL their other friends as well!! Art catch-22 goes something like this: artists need cheap space in which to live and work, so seek out run-down areas of the city where bargains can still be found, the only problem being that where they go, developers follow – cashing in on the ability of artists to create a vibrant community. Which then prices out those very artists who made the area desirable in the first place. Shoreditch may still be London’s East End art central but with all the industrial spaces now converted into chi-chi flats, studios and bars, the pioneers have headed off elsewhere – to Hackney Wick. ‘The Wick’ may be only a bus ride from Bethnal Green, but it is isolated by the A102 on one side and the giant 24-hour Olympic building site on the other. Until recently it has not only felt cut off but has been largely written off – as an unappealing no-man’s-land of shabby industrial spaces with no social amenities and an uncertain future. The ideal place, in other words, for artists to work and play. Last October Cherie-Marie Veiderveld and Simon Reuben White opened Elevator Gallery in a former chocolate factory; the gallery shows emerging and more established artists and attracts large crowds to their openings. ‘We used to squat in the area as students more than ten years ago,’ Veiderveld explains. One regular event is the Wag’s (Wick Art Galleries) dinners, hosted and attended by galleries including Elevator, the event-based Decima – run by David C West and Alex Chappel, and The Residence, run by Toronto-born artist Ingrid-Z. The Residence’s next project, ‘Hackney Wicked,’ will be a celebration of the area’s history. In August, as part of ‘Hackney Wicked’, the Wags and local artists will also be staging an art fair, open studios and an art Olympics – planned events include artists vs estate agents table football. The area’s current energy also comes from the knowledge that no property is secure. Elevator has the longest lease (until 2018) but Decima has only signed for two years. The Residence will have to move in 2010 when the building is pulled down: it’s too dilapidated to repair. Another important contributor to the Hackney Wick art scene is Space Studios. Set up 40 years ago by artist Bridget Riley and others to provide artists with affordable studio space, they now lease 15 buildings, three in Hackney Wick. The Olympics hasn’t directly impacted on them, but the ongoing redevelopment of the areas in which they’re based has They lost one studio block in central Hackney last year when it was sold to become luxury flats. ‘We’re keen to improve these areas for the people who live there,’ explains Space chief executive, Anna Harding, ‘but it’s always going to be a difficult balance between artists’ needs and local housing and employment issues. But artists also improve areas because they create a need for shops and cafés and a social infrastructure.’ With Hackney Wick already in developers’ sights, where might the East End art scene go next? Space’s newest studios are further east in Barking, but these are part of a larger development that also includes flats and creative business premises. Space is also looking south to Woolwich and north-west to Wembley, but when the Wags were asked where they might go next, many cited not further east in London but the former east of Berlin. For more info visit www.hackneywicked.com. Space Studio’s fortieth anniversary exhibition, ‘Space Now’, is showing until July 24 at Space Gallery (www.spacestudios.org.uk). You might have noticed that the Purple Hype Bus has now moved the Thursday afternoons. Kier & his amazing crew are here every Thursday inviting teens to try out the internet, video games & computer skills on board this incredible bus!! But - and not a lot of people know this - Kier helps repair your crook old bike as well. So bring along you bike & he'll get his tools out & show you everything you need to know - from how to repair a puncture - to how to go faster!! Kier has put in for funding to start a cycle club around the corner at Mabley Green - so watch this space for any new developments!! I recieved this invite today from another one of the olympic PR-types - Julie King. I think that as many of us as possible should go on this - as we are all affected in some way or the other. The London 2012 Olympic and Paralympic Games will deliver many benefits to the local community. Some are already being realised with new jobs and business opportunities. We also recognise that there will be an impact on the local community during the construction phase of the project. To encourage effective channels of communication, the ODA has set up the Olympic Park Engagement Network (OPEN) - a group that brings together representatives from different parts of the community who can meet with senior members of the Olympic Delivery Authority (ODA) team. We anticipate holding these meetings at least twice a year. I would like to invite you to join OPEN and to attend its first meeting on Wednesday 30 July 2008. David Higgins, ODA Chief Executive, and Ian Galloway, Chief Executive of CLM Delivery Partner, will host a visit around the site followed by a presentation and opportunity for discussion. A bus will meet attendees at Stratford Regional Station at 6.15pm. The tour and event will run from 6.30-8.30pm. To confirm your attendance please RSVP by Monday 21 July to george.middleton@london2012.com noting any specific access or dietary requirements. I do hope you are able to attend - your input will be extremely valuable to us in the months and years to come. Glastonbury comes to Leabank Square!!! Well........ one of our residents went to Glastonbury (lucky thing!) - and parked next to the portaloo for the painters!! Next we'll have tents pitching on the green. This has got to be the best way to travel around Leabank Square!! How's this for a fantastically appropriate flower for Nikolai to donate to our green?! Take a closer look at Nikolai's cheeks & see why it's the best way for us all to know who donated them - when they start springing up!! Thanks Nikolai (& his mum!). I know not everyone can make it onto our Leabank Square Wharf - so here are just a few pics showing how well all your flower arrangements are looking! Many condolences go out to Cyprus - who lost her favourite cat Gucci over the weekend. The newest planting in the green is a red rose bush planted in Gucci's memory. Cyprus - your rose is the most touching & poignant way to remember Gucci - and a lovely inclusion to our beautiful Leabank Square. Many thanks to Zoulla for taking these pics of some of Leabank Square's flowers. She's got one of those phone things that has a camera somewhere inside too - so whenever she's finished catching up with news on the bench in the green - she snaps a few pics for us too. If any of your kids go to Gainsborough School - then you'll have seen some of her artistic work there too. She was responsible for some of the murals (see: http://leabanksquare.blogspot.com/2008/06/gainsborough-leabankers.html - the mural in the top pic!) that you see dotted around the school! Zoulla - thanks for being a roving photographer for the blog - please keep 'em coming in!